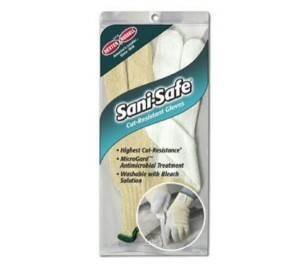 Sani-Safe Cut – Resistant Glove, size medium, constructed of Spectra fiber, stainless steel wire, and specially engineered yarn. Meets ASTM 1790-97 standards for highest cut resistance (Level 5), MicroGard antimicrobial treated to inhibit bacteria growth, fully encapsulated fibers for easier cleaning, washable with bleach solution. 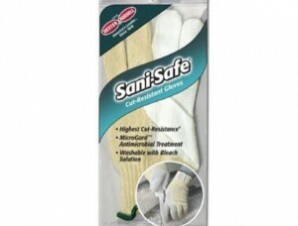 CAUTION: Product is cut-resistant but not cut proof or point puncture resistant. Not for use with moving or serrated blades.